Public engagement activity: a school visit to talk about the fruit fly! 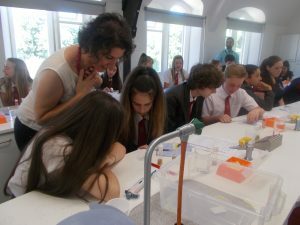 home > chiara > Public engagement activity: a school visit to talk about the fruit fly! Chiara has participated with other 7 volunteers from The University of Manchester in the school visit that took place on the 4th of July 2018 at Scarisbrick Hall School near Wigan in Lancashire. Here is the team before the event. From left to right: Chiara Francavilla, Andreas Prokop, Eemaan Memon, Megan Chastney, Sanjai Patel, Ryan West, Joanne Sharpe. 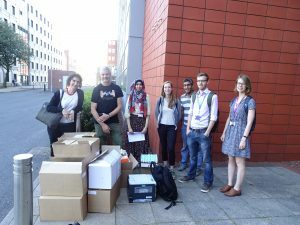 We met 160 students from 8 schools at GCSE/A-level (ages 14-17) who did rotate through four parallel 25 minute-long classes which all used the fruit fly Drosophila as a teaching tool. 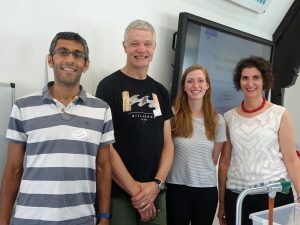 We discussed a range of topics relevant to the school curriculum: (A) nervous system (B) ageing/neurodegeneration/statistics (C) evolution/genetics (D) enzymes. All classes contained micro-experiments and PowerPoint files. Chiara and Megan (on the right) talked about enzymes and alcohol metabolism. We also helped students with an experiment using the fruit fly.